The Wolverine Gauge is listed in the Velocity series of boots, all of which feature a V-Frame exoskeleton. As best I can tell this is made of a rubber like material and is molded over an abrasion resistant mesh. However it is not made like pac boots which have a continuous rubber bottom and leather uppers. For one, the rubber-like part does not wrap all the way around the lower part of the boot and it is slotted so that quite a bit of the underlying mesh is visible. But enough about the V-Frame, let's talk about the boot. Based on appearance alone, these look like a serious pair of winter boots. I read on the product tag that the boot is rated to -40 F (- 40 C). It is pretty bulky compared to my Wolverine Compass boots which are the exact same size. However, it is not all that heavy, only outweighing the non-insulated Compass Boots by 3.5 (99 g) per boot. Given that the Gauge is also 2 in (5 cm) taller, I actually expected it to be a little heavier than it is. The boot is categorized as an 8 in (20 cm) boot and measuring from the foot bed to the highest part of the upper this is pretty accurate. However, when counting the sole, it stands right at 9 in (23 cm) tall. The Gauge has 7 pairs of eyelets. The bottom and top three are identical. The center one has a bigger attachment point and is set further inward. However all eyes require the lace to be threaded through them. And by that, I mean there are no speed hooks. Most boots will have speed hooks for the top three or so eyes. This is not that big a deal but it does mean that if I need to loosen the laces a lot to get the boots on or off it is going to be a little slower process. And since I have tall arches I generally have to loosen my laces quite a bit. This is how the boot looks from the front. Since I have never worn snow shoes or used gaiters I'll just quote what the manufacture says about these features. "The Gauge has added features for those who live and breathe for the outdoors, including a gaiter loop and a heel cleat so snow shoes can be securely attached with ease. The V-Frame exoskeleton is stable and supportive during long treks through the snow, and the boot has 400-gram 3M Thinsulate Ultra Insulation for a comfort rating of 40-below." There is no mention of what makes these boots waterproof but the web site mentions that they are breathable. It also says that the boot has a waterproof Americana leather upper. The tread on the sole looks fairly aggressive and is said to be "designed to excel in wintery conditions; wide pads on the ball of the foot and deep lugs are made of two distinct compounds for long lasting durability and dependable traction in snowy environments." Here is the tread. The boot has removable insoles which can be replaced when they wear out or if another type is preferred. A few more features are mentioned. I'm not sure what they all mean so I'll just add them here. "Molded TPU, abrasion resistant mesh, waterproof Americana leather upper. Wave mesh lining with waterproof membrane. 400 grams of 3M� Thinsulate� ultra insulation. PESU II EVA with NXT� order control sockliner. Compression molded EVA midsole. Dual-density rubber lug outsole. Cement construction." I chose the 11.5 EW based on how my Wolverine Compass boots fit and I was not disappointed, they fit just about perfect. They do feel a little narrower in the toe area but this may be due to the fact that this boot is stiffer and the Compass boots are well broken in. I actually prefer my winter boots to be roomy because they seem to be warmer than tight fitting boots. However, I may find theses boots stretch a little as they get broken in. Speaking of which, I initially thought the Gauge boots might need a little breaking in, but now that I have worn them all day several times and on 2 fairly long walks I'm fairly confidant that they will not. I wore them all day the day we picked up our new dog. This is our first house dog so after getting him home I took him outside about once an hour and basically followed him around the yard. The next day was a repeat but I also carried him on a long road walk of about 2 miles (3.2 km). I noticed that the Gauge boots were extremely comfortable during this walk. I finally got a chance to walk to the holler on Christmas day. My mom was in the hospitable with pneumonia and I had the boots on while we visited her. When I got home from our visit at around 2 PM it was raining but cleared up by 4:30 PM. I decided I had time for the 2 miles (3.2 km) hike to the creek and back. The temperature was mild at 55 F (13 C) but the air was very damp, even misty. I made it down to the creek just before dark and took a few photos. My first test was walking down the steep and slick trail to the creek. In my rush to get out the door I forgot my hiking poles which stay at my front door for just such circumstances. I remembered them in just a few minutes but I knew I did not have much daylight left so did not turn around to get them. Turns out I really did not need them because the traction of these boots is fantastic. The trail was slick, it had just rained for 2 hours but I did not slide much at all and I have had trouble under similar conditions with other shoes on this same trail. I was rushing on the way down but did notice that my feet stayed in place and my toes did not slide to the front or feel constricted. After I got to the creek I did a quick wade test to see if they were waterproof. I only stayed in the water a few minutes but the water was moving fast which makes them even more likely to leak. They did fine. I next pulled off the right boot for a couple of quick photos. I had not laced them in the very top eyelet so it was pretty easy to get them on and off. Once I had the right boot off I felt inside to see if there was any dampness and there was not. By the time I got the boot back on it was nearly dark, but since I know the trail by heart I held off pulling out my headlamp. I was no longer in a rush and took my time walking home in the near darkness. There were a couple of times that I took a step and slid back a little, but this is nothing out of the ordinary for these trail conditions. I also got off the trail in a couple of places by accident. I was again impressed at just how comfortable the boots felt and that they did not feel heavy or cumbersome on the climb. As I neared the top of the bluff I heard thunder so I picked up my causal walking pace. When I saw lightning I decided to cross over into the pasture and jog on home. I did not quite make the 1/4 mile (0.4 km) distance at a jog (I'm out of shape) but again, the boots felt fine. When I got home I was out of breath but did take the time to pull off the boots to see if they were still dry inside. They felt dry even though I had worked up a pretty good sweat. That's all for now. Since winter is just arriving around these parts I look forward to putting these boots to good use and will share my findings. All testing has been here in Northeast Alabama, mostly on local trails or to town and work. I have worn them on 2 overnight hikes, several day hikes and several miles on the road walking my dog. I also wore them on a couple of bike rides, both on and off-road. Since receiving the Gauge boots the weather has been a mix of conditions, ranging from cold and damp to warm and sunny. The coldest and probably toughest testing was on an early morning day hike at 28 F (-2 C) with some snow on the ground. However, I did wear them on a couple of other occasions when it was slightly cooler, just not for an extended period of time outside. Elevations have ranged from around 600 to 1200 ft. (183 to 366 m). One other note: I was expecting my left knee to be fully recovered from surgery by now but still find it tender so I have been limited to staying on trials and trying to avoid rough uneven terrain as much as possible. This also kept me from doing any high mileage hikes. The following observations are from my two overnight and one of my day hikes. I wore them on a short 2 mile (3.2 km) overnight hike on January 2, 2013. It was a chilly 45 F (7 C) when I left the house and cooled down to 33 F (1 C) by the next morning. My pack weight was pretty low at 24 lb (11 kg) and I basically just hiked down to the creek shortly before dark, set up my hammock for the night and then hiked home the next morning. I used hiking poles to help with my knees. The trail was damp but not muddy. I found the traction and comfort of the boots was very good for this hike and my feet stayed warm inside the boots. On January 18 I hiked about 4 miles (6.4 km) in them on a 2 hour hike in snow. The snow was actually from the previous day and had partially melted and then frozen overnight. This made conditions slicker than they would have been had I been able to hike in the newly fallen snow. It was 28 F (-2 C) when I left the house but warmed up to 33 F (1 C) by the time I got home. I used my hiking poles, and while I did slide a little on some of the steeper sections of trail, I found the traction of the Gauge boots to be excellent. I was also pleased that my feet stayed warm and dry during this hike. This included several short rest breaks climbing back up the trail. My other overnight hike was on March 12, 2013. My pack weight was about the same as the last time but I did not weigh it. The high on this hike was 51 F (11 C) and the low was a chilly 35 F (2 C). I had actually planed an overnight hike the previous weekend when it was much warmer but working on a ladder two days in a row helping my dad put a tin roof on his shed left me very sore and unable to get around very well. I did wear the boots during the roofing project but I don't think they had anything to do with my knees (both, but especially the left) hurting so much for two days afterwards. Anyways, since my knees were still hurting I decided not to hike down to the creek but instead stayed on the trail that goes around the top of the bluff. It has lots of ups and downs but nothing near as steep as the trail leading down to the creek. I hiked 2 miles (3.2 km) to an overlook, then a mile (1.6 km) back to a good campsite and then a mile (1.6 km) home the next morning. Due to some recent rain the trail was damp, but again, not real muddy. I had to cross a couple of feeder streams that I can normally jump, but with my knees hurting like they were, I carefully waded across in places that were not deep enough to get any water over the top of the boots. Considering how cold both the air and water were, I was relieved that the boots did not let any water in and kept my feet warm and dry during the entire hike. And while I avoided the steep terrain of the holler, I found the traction to be very good. As might be expected with my limited mobility, the boots are still in very good shape. Other than a few scratch marks around the toe caps the outside of the boots look pretty much new. The sole (tread) is also holding up rather well. What I did find interesting is that the writing on the insole of the left boot still looks new. I guess I should not be surprised since this is the knee I had surgery on, and even though I can't tell I am favoring it much, obviously I am. However, I remembered a similar experience testing a pair of trail runners so I went back and looked at that report to see if the left shoe showed the least wear. I'm not sure what to make of it but in that test it was the left shoe that showed the most wear, in other words, exactly the opposite of this time. Below is a photo of the boot insoles and the photo in the other report can be seen here. I have also been satisfied with the way the tread does not hold a lot of mud. Even if a little stayed in some of the cracks it would fall out the next day after they completely dried. So far I have managed to get any off the floor before the wife has noticed it. My only other observation is that I really wish these boots had speed hooks for the top couple of laces. It was no big deal when putting the boots on while I was sitting on the couch at the house, but putting them on while seated in my hammock after waking up a little cold and stiff proved to be more difficult than I anticipated. This concludes my Field Report. During the past couple of months I have continued to struggle with my injured knee. It would get better, but then just a little bit of exercise would have me hobbling again. I even hurt it once while out shopping with the wife. Add to that, the weather has been much warmer, almost too warm to test a full on winter boot. However, I still wore the boots quite a bit while day hiking and on two more overnight camping trips. One hike was with my backpack on a local trail but the other was a an overnight stay in a KOA campground in Tennessee. Interestingly, the elevation of my local hiking trail and the campsite in Townsend Tennessee are almost exactly the same at around 1200 ft. (366 m). The coolest temperature encountered was 37 F (3 C) during the overnight hike on March the 12th. 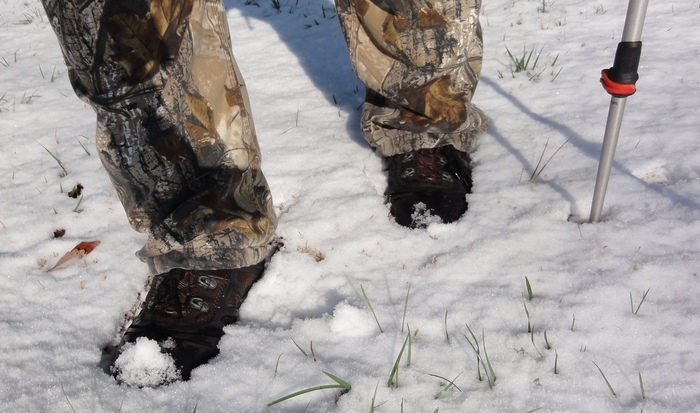 There has not been any more snow but I did wear the boots in some pretty wet and muddy conditions. I have still had to stay on mostly flat trails but did venture off trail briefly on one day hike near home and scrambled around on some rocks by the creek side during my stay at the KOA in Townsend. The overnight hike was on March 18, 2013. I hiked 4 miles (6 km) total. It was stormy during the day and I was not sure I would make the trip but the thunderstorms cleared out a couple of hours before sundown. The temperature was 55 F (13 C) at the start of this trip and dropped to 37 F (3 C) overnight. This hike followed the same route as the March 12 overnight trip, but to help my tender knee I did some major load (weight) cutting. I got my total pack weight down to 17 lb. (8 kg). The trail was wetter on this trip than any of my previous trips but the Gauge boots proved to be very stable. I also had to cross a couple of small streams that were out of their banks but with the aid of my hiking poles and by carefully picking my way across I was able to avoid any water going over the top of the boots so my feet stayed dry. I have continued to wear the boots on short day hikes but again, my knee prevented me from attempting anything very strenuous. After about the forth or fifth cycle of getting better and then re-injuring the knee I bought a knee brace. It has made hiking a little easier and has so far prevented any new setbacks. My first hike with the brace was only about 2 miles (3.2 km) round trip but I got lost and did a little off trail hiking. I was trying to find a particular land mark to show to a friend who was visiting from out of town. He was pretty worried about me going and suggested I wait until he could come again later in the summer. However, I had been taking it easy for over a week and was anxious to get outside. We started out hiking on a trail that soon disappeared into a mess of blow downs and brier patches. Crossing the logs and ducking under saw-briers was doing a number on my knee so after a few minutes we decided to go back to my truck and drive around to a different access point and try coming in from the other direction. This time the trail did not disappear and we managed to find the landmark (a big rock) I was hunting. I had my friend take a few photos of me wearing my knee brace, but unfortunately, it was with my camera phone and he must have been very shaky. I next wore the Gauge boots during a camp out in a KOA campground in Townsend Tennessee on May 17. I was there for a Recumbent Rally. The weather was warm and humid and to be honest, if I were not testing these boots I most likely would have worn a much lighter and cooler shoe. I left the house at 7 AM and wore the boots while driving the 4 hours up to the Rally. They were OK for this, but on such a long drive, a smaller, lighter and more flexible shoe would be my preference, partly because I drive a compact straight shift truck and partly because my truck doesn't have a cruise control. It was 71 F (22 C) a little before noon when I arrived at the bike shop that was hosting the event. I checked in and then rode a couple of demo recumbents and trikes with the boots on. It was about 75 F (24 C) when I arrived at the KOA at 2 PM. However, they really did not make my feet feel all that hot during the afternoon. 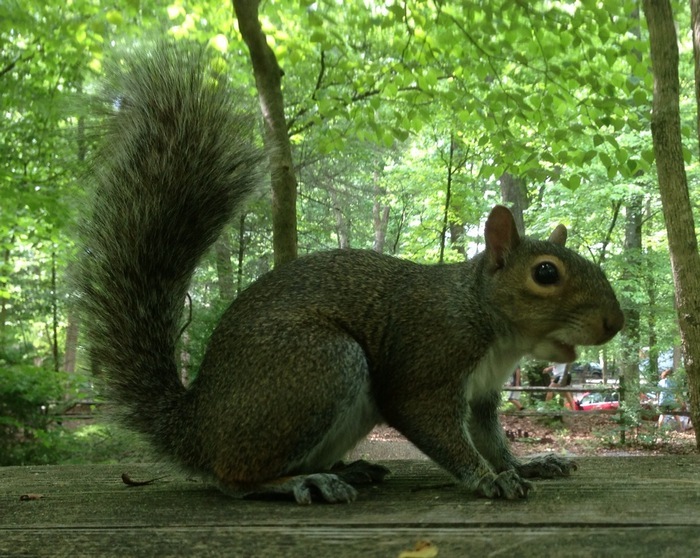 I set up my hammock and then took some photos of my new friend who was playing on my picnic table. Here is my new friend. And how does this relate to the report? Well, my boots were under the table, just a few feet away from him. It also proves that my cell phone can take a good photo if held steady. Keeping in mind that I'm still limping a little, I then proceeded to walk around the campsite looking for some of the other riders that were supposed to be in the campground. I found one recumbent sitting out by a motor home but no one answered my knock so I walked on up to the store and got the WiFi password for my phone. I walked back to my campsite only to discover I was out of range so walked back up towards the office and found a nice shady bench. After posting a few pictures of my new friend on Facebook I headed back to my campsite, took off my boots and took a short nap. When I got back up I put my boots back on and walked down by the creek a few minutes and then back to my campsite where I picked up my bike. I then rode out of the campsite and up the road about a mile (1.6 km) to a barbeque place I had spotted coming in. On my ride back to camp I checked to see if the guy I had looked for earlier was around. He was not so I rode on to my campsite, then eased down by the creek and relaxed as I waited for dark. I needed to be up at 5 AM so I turned in for the night shortly after dark. I wore my running shoes for the ride around Cade's Cove the next morning and then my Crocs on the drive home. The good news is that the 11 mile (18 km) ride must have been good for my knee. 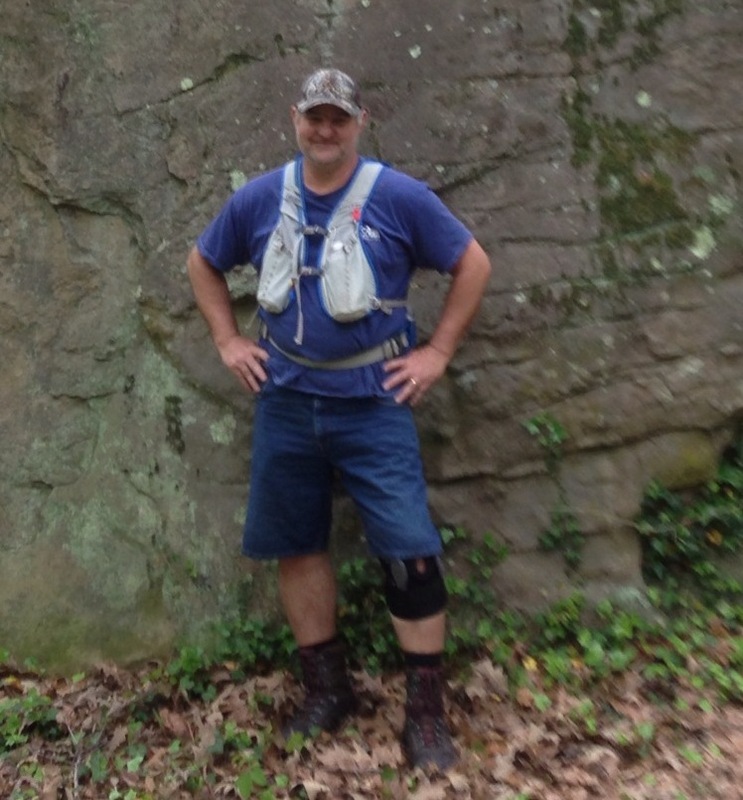 It is feeling better now than in months and I am so looking forward to hiking back to the holler again. I think the Wolverine Gauge is an excellent winter boot. I found the traction to be great with snow and ice on the ground and they always kept my feet warm and dry. They also provided good traction when the trail was wet due to lots of rain. I did find the boots to be a little overkill for many of the conditions I encountered and a lighter more flexible shoe or boot would have been better suited for the activity at hand, but I was still impressed that these boots did not make me feel weighed down. I don't foresee wearing them during the next several months, but when the mercury drops again, these boots will be a viable option for whatever mother nature may throw my way. This concludes my report for the Wolverine Gauge boot. I would like to thank BackpackGearTest.org and Wolverine for this testing opportunity.